Our student ambassador Max recently made 1,000 little blue origami dinosaurs that feature road safety messages of ‘Hold My Hand’ and ‘Slow Down Kids Around’. 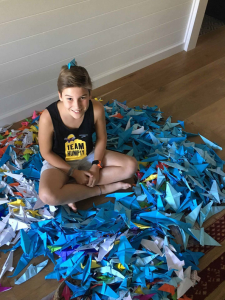 This amazing 11-year-old has created these origami dinosaurs while discussing road safety with his family and friends. Max has set a remarkable example of how road safety can be discussed in new, interesting and exciting ways with your children. Such a simple activity as creating origami dinosaurs which your children can help to stimulate meaningful discussions around the importance of road safety.